Pontypridd Youth celebrated a hugely successful season with their awards night held on Friday 29th June 2018. The Ponty youngsters had plenty of reasons to be cheerful, having been crowned as Welsh Champions following their regional play-off final victory over Bridgend Athletic at the culmination of the winter’s campaign. Nominated as Pontypridd Youth Player of the Year 2018 was dynamic flanker Dafydd Smith (pictured above). 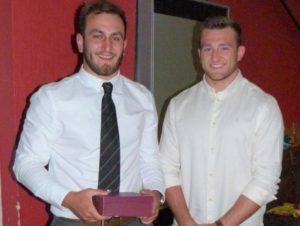 Smith was also nominated, along with fellow back rower Dewi Thomas, as Players’ Player of the Year. Most Improved Player of the Year was outside half Bailey Roberts, with prop Ieuan Frankland given the Clubman of the Year award. Shirt presentations were made to all players departing the youth age grade at the end of the season. Former Ponty Youth and current Blues centre Garyn Smith made all the presentations.